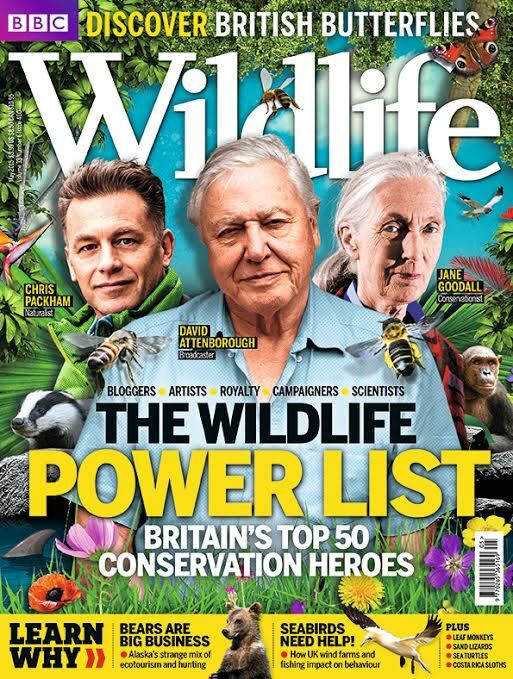 A few days back the BBC wildlife magazine announced their wildlife power list which consists of Britain’s top 50 conservationist. If you subscribe to the magazine you would of got your copy a few days ago but for those who don’t subscribe you can buy your own copy from the shops tomorrow. I feel very pleased and honoured to appear on the list, number 48, as there are some well deserving individuals which I admire considerably on there. Whilst reading through I straight away thought some were a great choice, some could have been listed higher up and I could think of probably another 50 people to feature on the list too! Obviously it’s not just myself who has an opinion on the list, on social media pages its been causing quite a stir and has been very controversial. I know from what they have tweeted, the BBC Wildlife Magazine have received a lot of comments about it too. Personally I think it’s a very good idea but nothing that serious. A bit of fun! The list is based around people who they think will make a considerable difference for wildlife over the next decade. I think a list of people who are going to make a bad impact on wildlife over the next decade would be a good idea too, wouldn’t be too hard to put together either! Everyone on the list is very worthy to be there in my opinion. Every one has made a great impact to the environment in different ways and will undoubtedly go on and do so in years to come. It was great to see some fellow young people listed too, these were Findlay Wilde and Jack McGowen-Lowe. It was also a good idea to have a mixture of people on there, from broadcasters and scientists to MPs and artists. As I mentioned before though I can think of quite a few which should definitely be on the list but they’re not. Some include individuals which may keep themselves quiet but they are most definitely deserving wildlife heroes. As I said it was great to see two fellow young people on the list but I could think of quite a few others which are also true wildlife heroes. One thing that did disappoint me was the amount of women on their compared to men. There was 14 girls on the list compared to 36 male which is quite a big difference! Never the less I think the list will really inspire those who read it! I would also like to say that on this Wednesday evening, 13th, I will be appearing on a documentary called the Great British Garden Watch. It will be on at 9pm on BBC 2 and should be a great hour! It will also be including a few other wildlife nuts like Findlay Wilde, and his younger brother Harley, and the wildlife gadget man, Jason Alexander. Previous PostWhat now?Next PostUrban Peregrine Excitement! Great post Georgia. And really well done on all the badger awareness work you have been doing. Thank you Findlay and you too! Well done. A fab blog post Georgia and a well deserved mention in the BBC Wildlife Mag Power List. When you produce a list like that you are never going to please everyone but I think the best thing about it is that it has created quite a buzz and debate. I wonder if it would have been better though to have not numbered (or ranked) the list? This would have eliminated the disagreements about who deserves to be in what position. Everyone on the list is on there for a valid reason so why suggest that any one of them is more important than the other?! I’m looking forward to the programme tomorrow night too so everyone can see how crazy…sorry I mean passionate…we are about wildlife! Yes that’s it, with it being a list some one is always going to disagree. Perhaps if they hadn’t included the ranking that would of caused less of a stir, As you say though everyone on that list were very deserving and so are many others which weren’t on the list are too. Yes me too! I’m sure it’ll be great…nervous though! Great work and glad this has been appreciated. Watching you on television, Georgia. Love what you’re doing! Are you on Facebook? I’m sure that thousands of people on Facebook would appreciate your work. Kudos for making the list – you thoroughly deserve to be on there! My copy of the magazine is currently being forwarded to me, I can’t wait to actually look at the whole list that has been talked about so much! I wonder how many people I will have heard of?